We are back home to a very cold and raining Melbourne, Australia!! From the bottom of my heart I'd like to say a huge thank you to you and your team for making out wedding day run so beautifully and effortlessly. We truly didn't have to worry about a thing, everything was beautiful - from the decorations to the flowers and table set up etc. You truly have a great team also -Pande, the hair and make up artists, the photographer, videographer and anyone else i may have forgotten, ran the day very professionally and effortlessly. We had a Hidden beach wedding and it was better then excepted. Professional team, perfect arrangement, beautiful place and view, wonderful decoration- just dreamlike and romantic. We had a great time with the seven agency, especially with Marsha and Alul. They made our dreams come true. Unforgettable !!! The photographers were amazing. We got a lot of great and heavenly photos!! A special thanks to the best videographer Arthur Devadatta, who created for us a magical video!! // Everything was absolutely fantastic !! Thanks to you all, we will never forget it!! We did our Wedding in Bali in November 2015, with 50 guests coming from France. We want to say a huge THANK YOU to the Seven Agency for helping us throughout the preparation. They have been here for us since day 1, Anna always replied quickly to our emails, suggested good ideas and respected our budget. On the big day, Pande was in charge, and he did an incredible job. Everything was smooth thanks to him, and even though it rained, he organized for every single chair to be changed, every napkin, and made this transparent for us. I cannot imagine what would have happened without him and his team. The photographer, videographer, photobooth, everything is worth its price. I can barely begin to describe how happy we are with everything we booked through the seven agency. You can go with them eyes closed, they really take care of everything. Today's photosession was very very great. The staffs are very very friendly. And also the places that we went, it was very very beautiful. For example the first place, the waterfall, followed by the park, and also the ricefield as well. All the venues and the places, the settings are very beautiful. And the photographers are very professional as well. We're very happy with the service. Looking forward for the results. Thank you!!! I'm really happy for all the arrangement from the wedding ceremony also for the photo taking today. So I'm pretty grateful here to have them to arrange everything. It's perfect. We can't wait to get the photos and we don't have to take care of the other stuffs. So thank you for take care good of us!!!! Thank you Kiki for everything!! We have absolute fantastic day. It was so well organized. The weather was beautiful and my bride was beautiful. And our sons were very well behaved. We had the best wedding of all time. We can't thank The Seven Agency enough. It was great. The make up, the hair, the flowers, all the staffs were amazing, our personal assistant was amazing. We couldn't recommend it more. Highly recommended. You guys are awesome!!! Seven Agency planned a perfect wedding for us. We are so happy! We are looking forward to meet all the guys frm Seven Agency again one day. So please go ahead and use The Seven Agency for your wedding because they would plan a perfect wedding for you, guys! So we just get married. And we're so happy. We don't feel this happiness like in normal time. And I wanna say thank you. The people that help to do this beautiful ceremony, this beautiful decoration, flowers, beautfiul photographers, and beautfiul smiles. And the Superman Alul :)) I like everything. 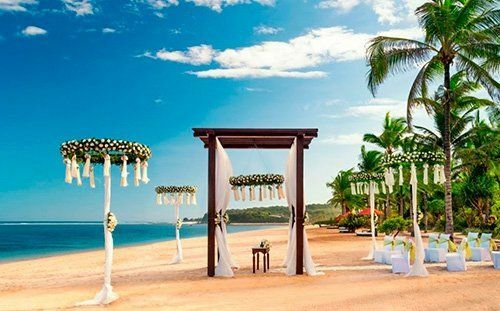 Every moment of this beautiful ceremony, beautiful beach, beautiful place, beautiful view, ocean... This was my dream and you guys can realize my dream so I wanna say thank you to Alul. Because he's so cool, he's so helpful to do this ceremony, So I and my husband are very happy. Thank you, guys! I'd like to thank The Seven Agency's team for providing this event. They organized really really good. Everything goes perfect. They take care of everything and carefully plan. The performance was really fascinating and outstanding. We really enjoy. There are assistants. They helped us through the whole day. Thank you, guys! You really made this day special for us!!! We had a fantastic time today. My makeup and hairstyle is fantastic.The location of the ceremony was beautiful and the restaurant at the Edge has a spectacular views. The decoration was also fantastic. The staffs are very friendly. And we might come back for the second wedding :-) or redo our vows one day. We truly had the most beautiful day of our life and cannot thank the seven agency to much. Everything was so good; the email contact from holland whith the seven agency; quick answers en very helpfull whith everything. Then our meeting in Kuta at the office whith Kiki was also really nice. It felt so good from the moment we stepped in. We had our wedding at Waka Gangga resort which is a dream place. Also the personnel there is so so kind! Everybody has done their best to make it a wonderfull day for us en it certainly was. The potographer from the agency was also really good en very nice. Everything was arrangend so good. It felt great, safe and trustfull. Thank you se7en team for marvellous moments. Appreciate the great assistance from Ann. Especially thanks to photographers Agu and shotti for great photos. We were some kind of worried while ordering wedding ceremony in India. We heard many stories that there is dirty, nowhere to go etc. Also, we were not confident about wedding planner there. In the internet we found only a few companies but you guys made us fall in love with you at the beginning of our communication. You replied fast, concrete and straight to the point. Our wedding in Goa was almost perfect. And crazy :-) Thank you for the great job. Ivan and Nata. Thank you, The Seven Agency for a super job for our wedding in Goa. All was the best, including photographers and make-up girls. Special thank you to Lyna who prepared really amazing surprise. We are very happy about our wedding in India with The Seven Agency. Guys did everything what we were dreamt of. Hopefully one day we will make vows renewal with The Seven somewhere else. Highly recommend this wedding company. Nikolas and Jane.